There are ten legislative assembly constituency in Kanpur Nagar district for the 2017 Assembly elections. They are 214 Arya Nagar, 209 Bilhaur, 210 Bithoor, 218 Ghatampur, 212 Govindnagar, 211 Kalyanpur, 216 Kanpur Cantt, 215 Kidwai Nagar, 217 Maharajpur, 213 Sishamau. When Uttar Pradesh assembly election 2017 is getting ready to electios new Assembly, Kanpur Nagar is not anywhere behind in the election heat. Kanpur Nagar district is one of the districts of the Uttar Pradesh state of India. It is a part of Kanpur division and its district headquarters is Kanpur. The old name of kanpur was Kanakpur in age of Ramayana. Due to increase in population of Kanpur District, for proper administration it has been divided into two. 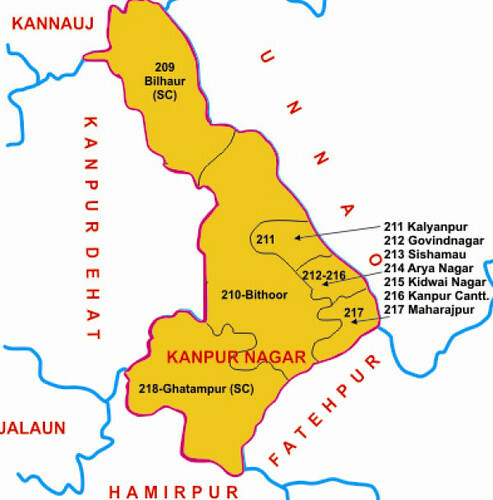 Kanpur district was divided into two district namely Kanpur-nagar and Kanpur-Dehat in year 1977. Reunited again in year 1979. Again separated in year 1981.